I am not sure whether I was in denial or just being lazy. 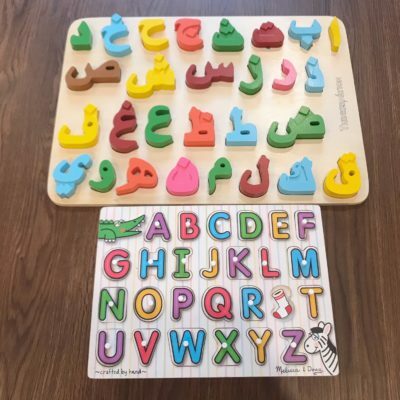 My daughter enjoyed learning her Arabic alphabet, and all I had to do was print out some flashcards and download the Qaaidah Nuuraniyyah app, wala! No complaints and she was learning. I thought I would do the same with my son, except he had no interest in learning his Arabic alphabet. He did like listening to the qaaidah (once in awhile), but ask him to do anything else…. there was just no way! 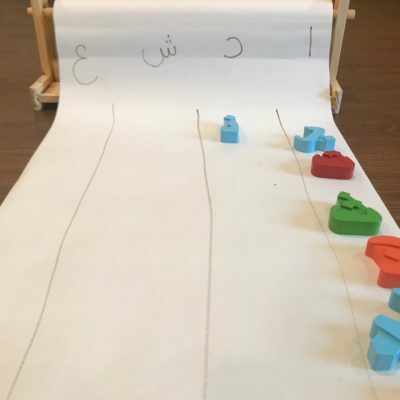 This is where I got a little lazy and thought both my kids learned in the same way… so I waited too long to incorporate the toys that he already loved as a way to help him learn his Arabic alphabet. It is how he learned his alphabet, numbers, and much more. 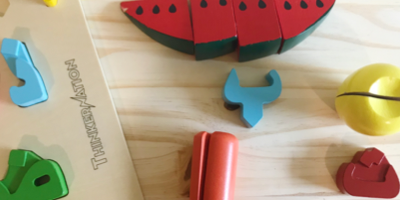 Through play, and hands-on activities. For children play is a serious way to learn and develop skills. While playing pretend grocery children will often times use math and literacy. They learn new vocabulary as they are playing and counting their toy fruits/vegetables. But most of the time when we hear learning through play we tend to over complicate it. We think of all the toys to buy and think of ways to incorporate them. 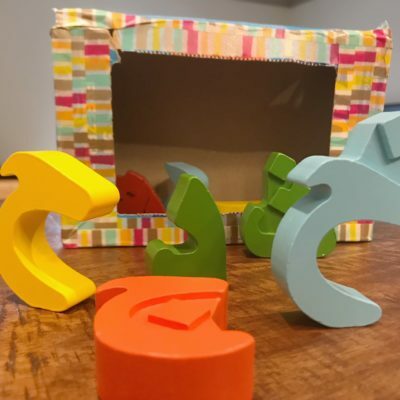 Instead, I learned to focus on open-ended quality wooden toys that will last and allow you to use it in more than one way. It’s not the quantity (of the toys) that matters as much as the quality of the toys in terms of longevity and purpose of the toy. This is sort of a minimalist way of looking at toys before bringing them into the house. Story Books (knowing this I entered a few giveaway and won an Arabic storybook which I will tell you all about next time Insha Allah). Anything with trains, construction trucks, and animals. 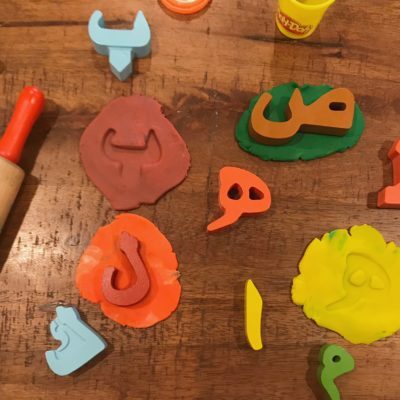 There are so many ways for kids to learn letters while playing games, so I gathered a list of my favorite Arabic alphabet games. 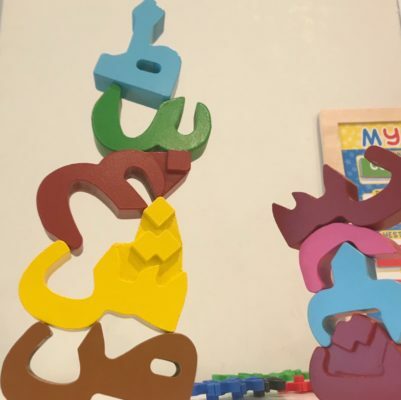 These games are sure to make learning the Arabic alphabet a fun and playful experience. Plus as an added bonus you won’t need much to set it up these games. We have actually found that we use one toy over and over again. I also doubt that I will be losing one letter under the fridge, dishwasher or oven anytime soon. All moms can relate to the mixed feeling of not wanting to move those big appliances and knowing a small toy is under there. Now on to the games we have been enjoying. The first one is the Arabic Letter Matching game. This one is easy to set up and younger children (preschoolers) love matching activities. 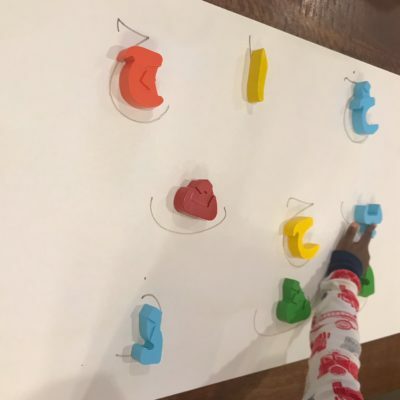 For older children a “what comes next” game will not only encourage revision but is also challenging for children who already know most or all their Arabic Alphabet. Another game that develops gross motor skills and works on hand-eye coordination is “feed the zakkah box”. We started off with a big box that the children aimed for as a target but to keep it challenging we now use a smaller one. I am sure we will continue to find more ways to enjoy the ThinkerNation Arabic Puzzle. So if formal lessons and flashcards are not your child’s thing. Maybe they just need more games and toys incorporated into their learning. With that said, do you play games to learn Arabic? If you have more game ideas for us, do share it by commenting below. The post above contains affiliate links. Some great ideas here, especially like the use of dough & drawing around the letters to familiarise yourselves with the shapes! Glad you like it 🙂 we have been playing a couple more games that I will share insha allah. Wa alaikum salaam, Masha Allah. May aallah make it easy for you 😘. I hope you and your family enjoy the journey.